Here’s an interesting note of trouble from the usually placid Rogue Valley. According to the Ashland Daily Tidings (in a story published appropriately enough on May Day), backstage crew at Oregon Shakespeare Festival want to unionize. If there’s any institutional structure that stands on the opposite end of the spectrum from the kind of entrepreneurial arts spirit that America needs more of and that created OSF, which is now one of the great theatres of the world, it’s the union. The mindset of owners everywhere, and of artistic risk takers and visionaries in the theatre specifically, is “what can I build”. Whereas for unions, it’s all about “what can I take”. For union members, the “I just work here, time to make the donuts” mindset is anathema to innovation and collaboration. Collectives of innovator/operators have skin in the game. If they do something that works, everyone benefits. If something doesn’t work, everyone shares in the downside as well. Unfortunately the theatre world is lumbered with the outdated union model, especially at the high end. As we saw with the circus in Los Angeles recently over Equity’s decision to install minimum wage pay for actors in 99 seat theatres, inserting bureaucracies and rules in between individuals and producers is the last thing anyone wants – except apparently the union “leaders”, i.e., just the kind of management layer unions were built to oppose. It would be no surprise to comrade Marx that the theatre, like any other environment, is influenced by the nature of its economic relationships. The reason why some of the best theatre is often at the smallest end of the organizational spectrum is because collectives of young people come together to create something together. Everyone is an “owner”. You feel this in the work itself. It cannot be faked. Then once a theatre is successful and grows larger, there comes that fateful day when there’s a knock on the door, and it’s the union. Ultimately you end up in a barren environment like Portland’s PCPA, where everyone’s punching the clock and the audience has to sit through generic crap that pays the bills – but delivers no art. Talk to any business owner who has created something from nothing – like Noble Coffee in Ashland – and ask them if they’d like a union to get involved to make sure their employees are taken care of. You’d get a perplexed, uncomprehending stare. What? At good companies, one of the reasons people want to work there is because of how employees are treated. When you have good management, as OSF surely seems to, the last thing you need muddying the waters is a union. It would be a shame if higher costs and more bureaucracy start to erode the special OSF experience and intimate connection with the audience. As soon as anyone starts viewing the work they do at OSF as just another chance to extract a pound of flesh, it’s the beginning of the end. 9.3.2015 UPDATE I saw the show for a fourth time on August 15, 2015, and it has gotten much, much better since March/April, when I saw it three times in close succession. It appears a number of the issues I called out below have been addressed. I definitely recommend seeing it now. Solid – but not without lots of small issues and a couple of big ones. 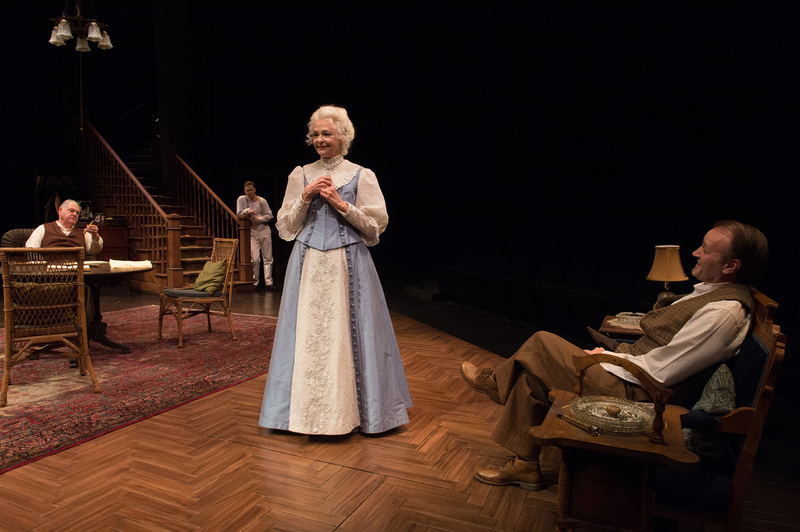 Oregon Shakespeare Festival’s production of LONG DAY’S JOURNEY INTO NIGHT (LDJIN), Eugene O’Neill’s autobiographical masterpiece and family expiation, is hampered by age-inaccurate casting, non existent Irish context and a general lack of directorial vision and style. Despite the limitations, as this ultra marathon of pain moves on toward its near four hour length in the second half, the sheer fascination of watching a literal reenactment of the psychic alchemy that made America’s first great playwright wins us over. Though he surely did not intend to, O’Neill has assured himself personal and artistic immortality by weaving his own life story deeply into the fabric of this late play, which becomes only more revealing and valuable to fans each year as we move farther away in time from O’Neill’s own era. Even while the first half may drag a bit and the play ends with truly the worst directorial choice imaginable for O’Neill, the total experience on offer is still rewarding. It’s a good first viewing of the play for anyone coming to it new. Unfortunately it will not stand out for the devoted O’Neill scholars and enthusiasts who have seen the play many times before and travel the world ceaselessly (like ghosts in a Eugene O’Neill play), ever in search of great, defining performances of EON’s work. As an American touchtone, this long journey into O’Neill’s soul could be (should be) so much more than this. Especially when done on a prominent national stage like OSF. Eugene O’Neill’s original repertory company: his family. Michael Winters, Danforth Comins, Judith-Marie Bergan, Jonathan Haugen. Photo: Jenny Graham. Forget a man on the moon – how about GUYS AND DOLLS on the stage? High atop the list of America’s all time inter galactic achievements, right up there with space travel and skyscrapers and all that computer gadgetry, one somewhat less technical but ultimately longer lasting creation deserves a place: the musical play of the mid 20th century. 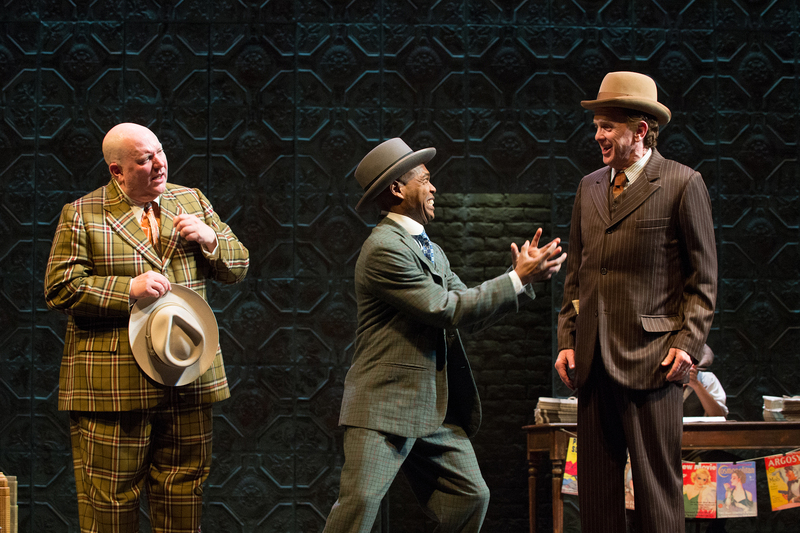 And what show could better embody the living large upswing of post war America (and especially New York) than GUYS AND DOLLS (1950), now setting fire to the Bowmer Theatre at Oregon Shakespeare Festival several times a week. It’s like this, see: Finding a version of Frank Loesser’s eternal hit better than Mary Zimmerman’s super saturated, pinstriped, technicolor, slicked back, dolled up and doubled down freight train of pure joy now on at OSF may prove harder than locating a free space for Nathan Detroit’s floating crap game. The Greek’s in town, the gang’s all here (even if a few of the crew ain’t all there – if you know what I mean) and the music, lyrics and choreography are unforgettable. Three reasons the Bowmer is on fire: Nicely-Nicely Johnson (Daniel T. Parker), Nathan Detroit (Rodney Gardiner), Benny Southstreet (David Kelly). Photo by Jenny Graham. Something interesting is afoot down south in Ashland, Oregon. Then again, something usually is in this major US and world theatre center. The play is SECRET LOVE IN PEACH BLOSSOM LAND by Stan Lai. It’s a big moment for Chinese culture in the US, and a very smart move by OSF to bring a world theatre piece like this to our shores. To learn more, here’s a series of interviews about the production. No translation needed for that point. Director Stan Lai. 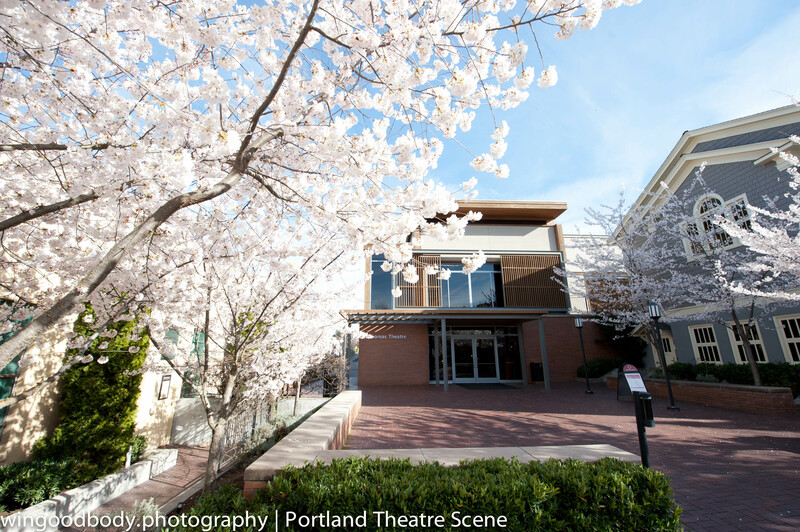 Show number six of the 2015 season at Oregon Shakespeare Festival opens today down in Ashland. How big of a deal is SECRET LOVE IN PEACH BLOSSOM LAND by Stan Lai in modern Chinese drama? Big enough that there are multiple news crews from China and Taiwan in Ashland covering the American premiere. Sounds like if you have yet to point the chariot southwards this season it’s now officially time. Coming next – the outdoor stage opens June 12-14. Ze piece de resistance there? It’s gotta be Jeff Whitty’s world premiere HEAD OVER HEELS, featuring music by the Go-Go’s. 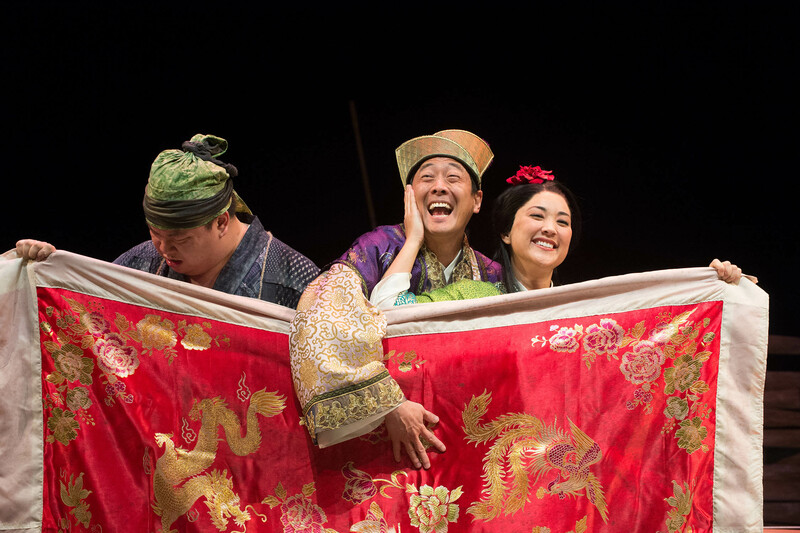 Master Yuan (Paul Juhn, center) and Blossom (Leah Anderson) have some fun behind the blanket, unbeknownst to Blossom’s husband Tao (Eugene Ma, left). Photo: Jenny Graham. Outside, blossom season in Ashland is already past. But inside it’s just getting started. Alright, people. Here’s your chance to get in on the ground floor. 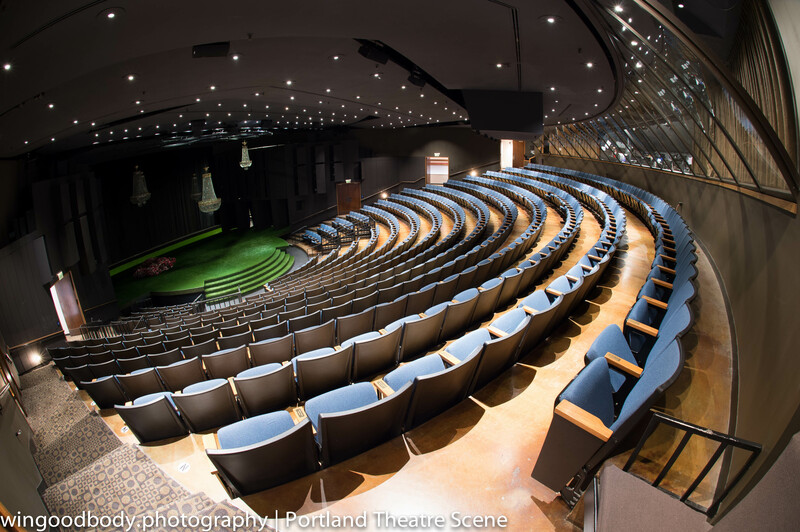 The internet barely knows it yet, but the next big thing is a viral celebration of the new carpeting in the Bowmer Theatre at Oregon Shakespeare Festival. You know what to do. 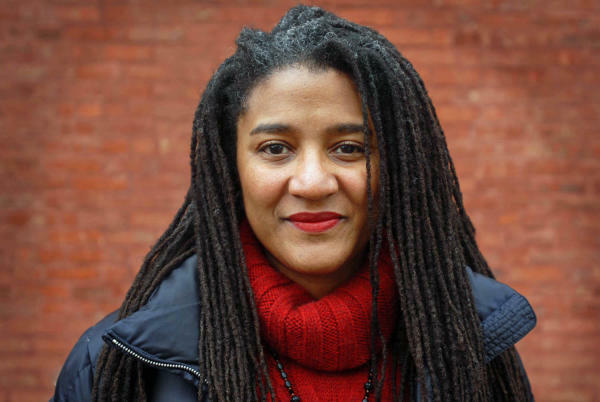 When visiting the Bowmer this year (which should already be on your radar by August at the latest if not before – world premiere of new Lynn Nottage play anyone??? ), simply look down and snap a pic of your feet on the new carpet. Then post to any platform with #BowmerCarpet. You can monitor the madness with a single view of all posts (FB, Twitter, Instagram, etc.) via #tagboard. Get in now and be able to tell the grand kids you were posting and tagging about the Bowmer’s new threads before #BowmerCarpet walked all over #PDXcarpet. We could have another Civil War style UO/OSU situation on our hands here. See that strip of snazzy new rug on the left? Get your feet on it and go #BowmerCarpet. How you know the apocalypse is near. 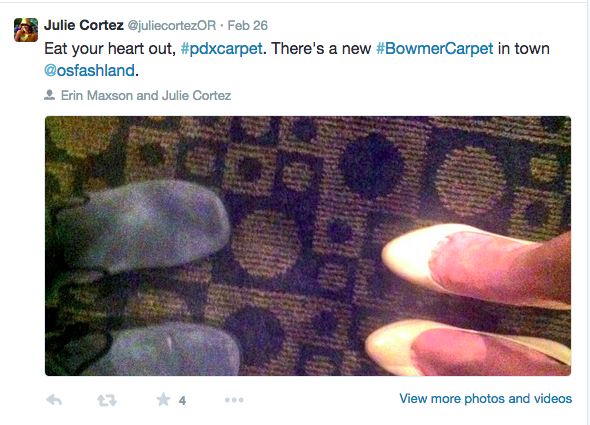 @pdxcarpet tweeting with its doppelganger about Easter. In just a few hours, the Tyrones will gather. 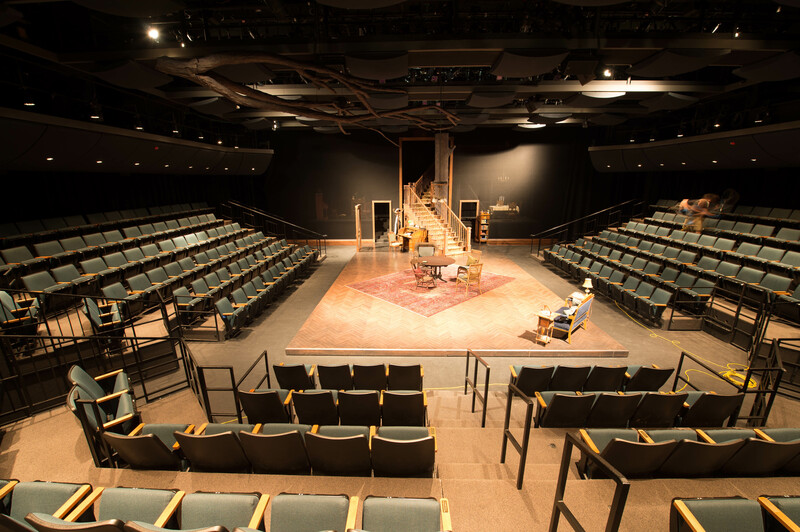 LDJIN opens this afternoon in OSF’s Thomas Theatre, configured on three sides for 270. The set for O’Neill’s family play.